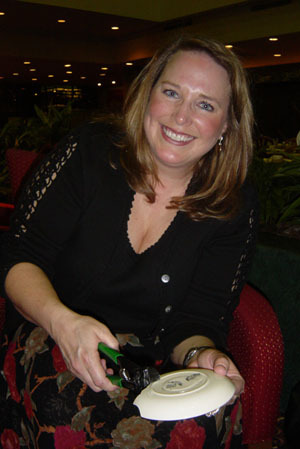 Wendy Catherine was the first overseas donor to the Made in England project. She and her husband Peter collect aesthetic tableware. 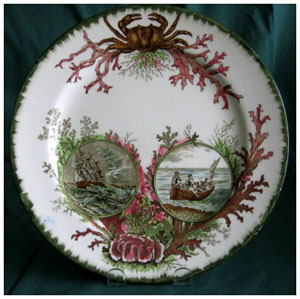 Their collection began with a piece of ‘Oceana’, made by Doulton in their factory in Burslem. The range depicted sea creatures. This piece gave birth to a real fascination with industrial ceramics of the period sometimes known as the ‘Aesthetic Movement’. The Aesthetic Movement is a name given to the British cult of beauty in art and design in the 1870s and 1880s. Aestheticism is derived from the 18th century philosopher Immanuel Kant’s view that art could only be judged by its own criteria, and not by those outside itself. The rallying cry of the movement (associated in the UK with the critic Walter Pater) was ‘art for art’s sake’ -- a radical counterpoint to Victorian moralism. The movement was one that affected not just painting, but also decorative art and architecture. The style is often associated with both the high and low art of Japan, hugely influential from the mid nineteenth century due to newly opened trade links. 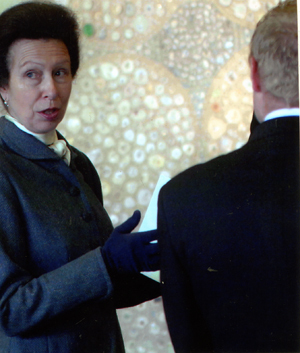 Wendy and her husband Peter came to see the mosaic once it was installed, and were special guests when Princess Anne came to visit the Museum.